Measuring our impact isn't easy. 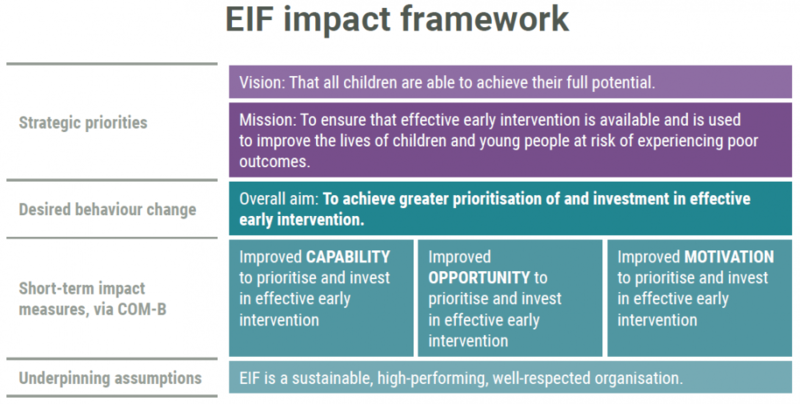 Stephanie Waddell describes the journey EIF has taken before settling on a behavioural model of impact measurement, and how this framework will help to both guide and understand the effectiveness of our work in the future. As a What Works Centre, we think and talk about impact all the time. We’re really good at assessing other people’s impact on child outcomes, and taking a rigorous approach to identifying and understanding the effectiveness of different approaches to early intervention is at the heart of some of our key resources, such as the EIF Guidebook. However, like many charities, we’ve not been so great at understanding our own organisational impact. We’ve been through several iterations of an organisational theory of change, and we’ve commissioned external evaluation of some key pieces of work. We have a set of statistics about the number of times our reports are downloaded or how often our website is accessed. We can collect some very complimentary comments from our stakeholders, and record when our recommendations or advice have been reflected in government policies or new initiatives. And, crucially, we’ve had contracts renewed and won new funding as well. Despite this, we’ve never really managed to corral these ‘outcomes’ in a way that feels like it aligns closely with our strategic priorities, represents the range of the work we do and the range of impacts we want to have, or genuinely enables us to develop and refine the way we work. Now, having recently launched our new strategy, it feels like the right time to think afresh about our impact measurement framework. Over recent months, we have dedicated some proper time and resource to the challenge, and talked to a range of people in similar organisations to ours, who were doing similar thinking. Nobody had all the answers, but everyone was generous with their time and ideas, and each helped us to understand parts of the puzzle. It became obvious to us quite quickly that we needed to think more about behaviour change: that our role was best understood not as seeking to impact on children’s lives directly, but rather as about driving increased investment in and greater prioritisation of effective early intervention. Obviously we care about the impact on children’s lives – our vision is to see all children able to fulfil their potential – but in terms of understanding the impact of our work from day to day and month to month, this sometimes feels too far removed. We care about getting evidence used in decisions about policy and practice (there’s an interesting article about the importance of studying research use as a behaviour here) – but beyond that, we care about whether or not people are convinced that early intervention is a good and important thing, and how inclined they are to prioritise spending on early intervention over all the other calls on public money and policymakers’ attention. To help us clarify what this focus on behaviour change might mean in practical terms, we delved a little way into the literature on behavioural science. One model which caught our eye was Professor Susan Michie’s COM-B framework, which forms the basis of the Behaviour Change Wheel. This provided a conceptual breakthrough for us. Thinking about behaviour change in terms of the Capability, Opportunity and Motivation of the people we are trying to reach helps to clarify the purpose and objectives of our work, and to think about how we might measure its effectiveness. We pushed it and pulled it, and decided that COM-B gives us a pretty robust framework through which we can describe about what we want to achieve and how we might go about it. In particular, the Opportunity lens forces us to think more carefully about the dynamic context in which our audiences are operating. We might be working to improve stakeholders’ capabilities (through information and guidance) or their motivation (through positive messages and useful arguments) – but if there are barriers within the system which prevent this knowledge and enthusiasm from being realised, then our work needs to address these too. Of course, it’s still early days for us. We’re starting to use the language of our new impact framework within the team, we’ve been experimenting with systems mapping, and we’re developing tools to help project managers to scope projects with behaviour change in mind. This means understanding current behaviour, describing the behaviour we want to see, and identifying the optimum ways to influence this. By doing so, we’re driving a greater focus on impact in everything we do. We’re thinking about impact and gathering impact-related data in a clearer, more consistent way than we’ve done before, and we’re excited about the possibilities this offers us to test and hone the ways we seek to use evidence to influence policy, commissioning and practice.